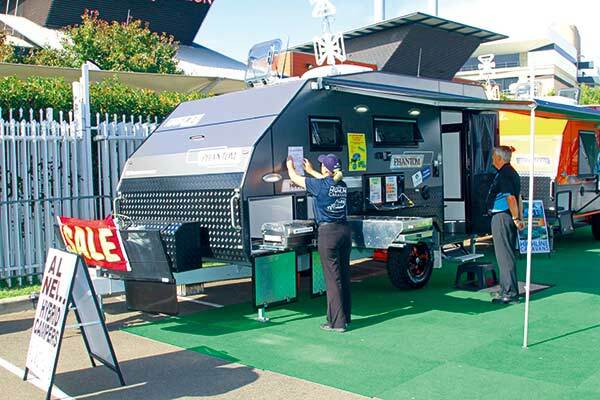 Camper trailers were again a major feature of the Sydney Caravan Camping Holiday Supershow, held at the Rosehill Racecourse exhibition centre over the week from April 24-29. Exhibitors from around the country presented a range of new and modified campers, with recent winners of the Camper Trailer of the Year competition proudly brandishing their newly won laurels. This year’s Supershow marked the 50th anniversary of the event, an occasion which matched that of Cub Campers, which had a major display in the camper trailer pavilion, and was also highlighted by an exhibit of vintage caravans going as far back as far as the 1930s. The crowds was again strong, and the weather generally excellent, especially in the first few days when unseasonably warm weather encouraged attendance. Some areas of the grounds seemed to be thinly occupied by camping exhibitors compared to previous years while other sections — notably the caravan and camper trailer segments — were as crowded and busy as ever. However, in the camper trailer arena there were a few surprise absences: Patriot was only represented by a single camper alongside the Kimberley Kampers stand; market leading slide-on Wedgetail which has been overwhelmed by orders; and newly defunct veteran manufacturer Aussie Swag. And a number of companies were surprisingly without new models or even major new features, though elsewhere things seemed to be advancing rapidly. Opus had its Airopus camper with its inflatable tent and awning on display and was drawing lots of attention, not least for the demonstrator who was walking around whacking the inflatable ribs with a baseball bat to demonstrate the unit’s toughness. A video display with the camper had a helicopter hovering above the unit, creating a powerful down force to try to alleviate people’s concerns that the camper would not stand up to strong winds. Things move fast in the high Altitude world, and the centrepiece sidefold/rearfold manufacturer, which last year went heavily for a forwardfold design has landed rapidly with its own pop top hybrid range, from a 12ft model up to an 18ft dual axle van. The 14ft model, as seen at the show, had an external kitchen that is a swing-around design, there is an internal sink with bench next to the shower/toilet ensuite, an eating nook for two, queen inner spring bed with plenty of room down each side, independent twin shock suspension with a ton of ground clearance, two spares and all the usual gear. To celebrate 10 years of presence in the Australian market Conqueror will be releasing some anniversary editions of their better known campers, the first being the UEV490 Platinum. Its stunning new grey paint scheme is a break from the company’s traditional olive green and takes it away from that military spec look. It comes with all options included as standard, including top end awning, solar, twin batteries, improved lighting, roof insulation, fans, entertainment package and lots more. 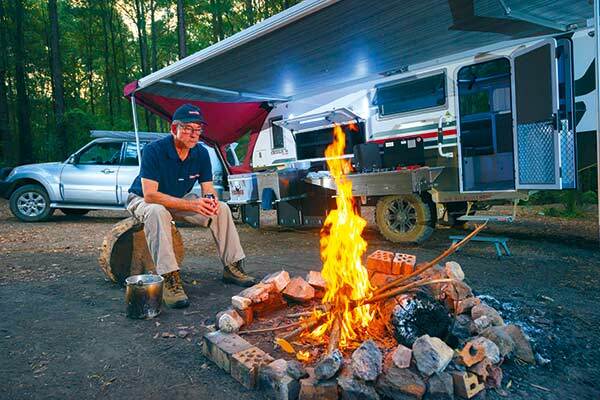 Premier Queensland camper manufacturer Australian Off Road has released a pop top version of its Matrix super camper. It has a narrow 1950mm wide body, large solar capacity and up to 340L of water, has optional grey water and black water tank systems, an internal shower and toilet ensuite, and with the pop top there’ not just a lower towing profile but it also has a larger awning, better airflow from the pop top windows. A neat design from a top line manufacturer. In CTA #125 we featured the Cub Brumby in its traditional grey colours, but Cub had one on their stand that was fresh out of their new spray booth, finished in bright canary yellow. And we’d have to say it looked very snappy and audacious. This should help Cub lift their profile with a range of colours and finishes as options now. Golf, which is a caravan offshoot of the Avan team, has released a small pod camper called the X265. This provides an internal double bed mattress, slide-out stainless kitchen, front storage box, independent suspension with good ground clearance, battery with charging system, dual 80 watt fixed solar panels, 30L compressor drawer fridge, 65L water tank and stone guard. The show model had an external shower, gas/electric hot water system and 9kg gas bottle. Tare weight is 1235kg and ball weight 140kg. All this gave a price of $32,375. Like a number of other caravan manufacturers, Highline Caravans has cashed in on the current popularity of hybrid designs by producing a hybrid that is essentially an extension of their van blueprints. It’s called the Phantom and features independent suspension on a Duragal chassis, external and internal showers, internal toilet, single 100Ah battery, 150 watts of solar, air conditioning, 24 inch TV, aluminium composite walls and is priced at $65,990. Budget manufacturer Marlin Campers has traditionally offered very basic sidefold campers designed to sell for around $4000 to $6000 but has now begun offering a Deluxe Package, which includes an Ark 300Ah power pack, tailgate ply kitchen, LED light bar kit, front storage box, pole carrier, 70L water tank and extended draw bar, all for a show price of $1999. MDC has now offered a 15ft pop-top model in their hybrid range. It features external and internal kitchens, 220L of fresh and grey water capacity, two spare wheels, pillow top queen inner spring mattress, multiple storage areas, independent suspension, separate shower and toilet ensuite, external shower, electric awning, Kenwood stereo, galvanised chassis and composite wall panelling. Normally at $59,990 it was reduced to $54,990 at the show. 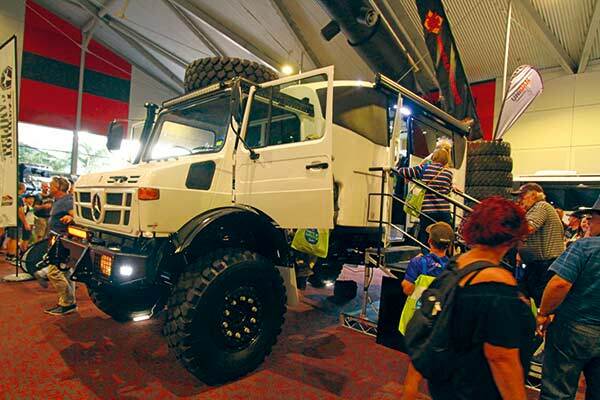 One of the most talked about displays at the show was the huge Unimog that had been packaged as a joint venture between Kimberley Kampers and Uniden. It was based on a 1980s Mercedes truck (but could also be ordered with a new Mercedes, for an extra price) and features bodywork that was essentially one of Kimberley’s E-class Cruiser campers with the nose chopped off. Uniquely, the truck, which is designed to flex in the chassis was attached to the bodywork via two huge central hinges which permit the body to remain rigid while the chassis moves around under it. There was a constant lengthy queue to step inside and take a look. Price? To you, $269,000. Though it’s not a camper trailer in the strictest sense, the new Mountain Trail LXV 5.7 has its feet firmly planted in its camper origins. This fantastic new 18.5ft dual axle van is an offroad caravan with a vengeance and comes with Mountain Trail’s award winning engineering, fantastic external kitchen (plus a full internal kitchen with fridge), Waeco CFX fridge, a huge internal wall of storage drawers, cupboards and wardrobe, internal shower and toilet, queen sized bed, front box as seen on their hybrid campers and rearfold camper and all the quality underpinnings for a true rough road rider. Priced from $118,500. 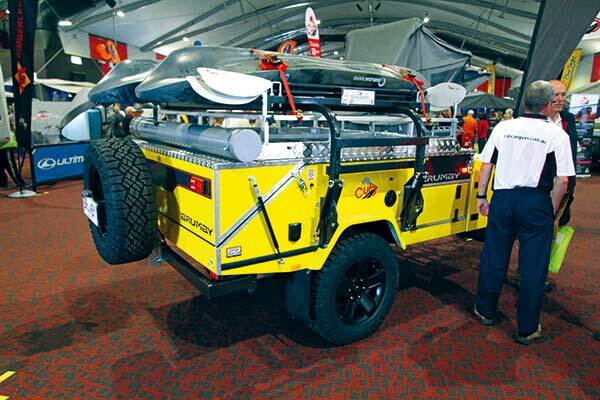 New from top Queensland manufacturer Trayon Campers is the Traymate budget slide-on. Starting at just $6000, the slide-on box (which can be a tradies pod during the week) can then be fitted out with a rooftop tent for a $10,000 for a 275kg base camper; with lights, a 100L Nova-Kool fridge,110L water tank, 120Ah AGM battery, a 1000 watt inverter, internal kitchen, lighting, hot water on demand and stove for $16,990 in a 400kg package; or add an awning, annex walls, kids’ room, drawers and kitchen bench for a 500kg $25,000 home away from home. Stoney Creek Campers was showing its new Nugget rearfold softfloor camper. This is a very compact design that will fit on the smallest site, with 16in alloys, stainless kitchen, independent suspension, 100K stainless water tank and plenty of storage areas around the outside and inside. Priced at $16,990 it was being sold at the show with an Evakool fridge and solar panel. Ultimate campers was offering the fantastic new Redarc Redivision camper management package which allows you to monitor and control all aspects of your camper trailer from the convenience of your smart phone screen as well as dedicated screen in the camper. It will be standard on the company’s Nexus TVMS model and optional on all others, as will be the company’s new auto opening struts. 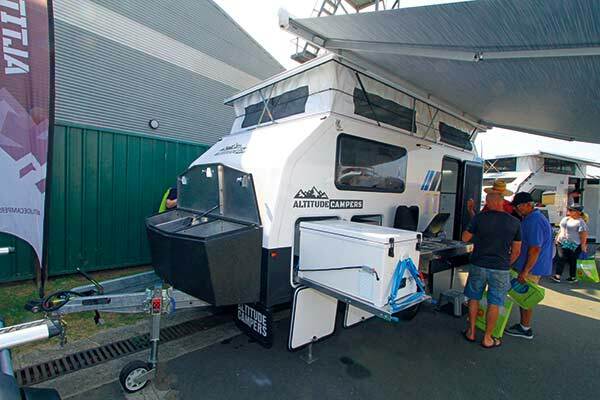 That last stand for great Aussie made sidefold softfloor campers, Trackabout Campers, has a fantastic slide-out kitchen. The CAD designed aluminium structure is 25 percent lighter than older versions, with a three-burner Smev cooktop, 60L Evakool fridge, plenty of soft close drawer space for cutlery, crockery, appliances and pantry items, and a huge return that provides a heap of bench space. This has to be amongst the best kitchens in any camper trailer. 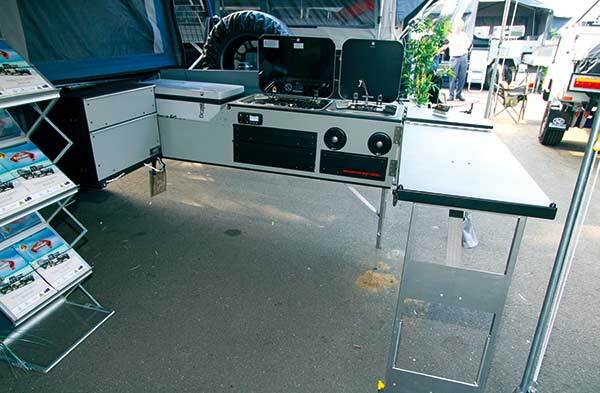 Windsor was another caravan manufacturer edging open the camper trailer door with a hybrid offering of a very specialised design. At only 1180kg it’s of a modest weight, especially for a hybrid, has a queen foam bed, with internal lounges and room for a table between or, more interestingly, space for two motorcycles or four pushbikes if they are your areas of interest. There’s an external kitchen with Sizzler barbecue, front fridge box, external fold-down table, independent suspension on a Duragal chassis, two batteries with 300 watts of solar and more. Niche design and marketing can open a new market reach.